This review has been a long time coming, I wish I had posted it before now, but better late than never, I guess. When I first started this review, there was only 1 version of this radio out, but now there are two. All radios with firmware 1.02 (1.01 was the old number) include the 2.5KHz step when tuning/scanning. As far as I know, that is the only difference between the 2 firmwares. There is no way to upgrade the 1.01 to 1.02, as far as I know. This is how they come from the factory. 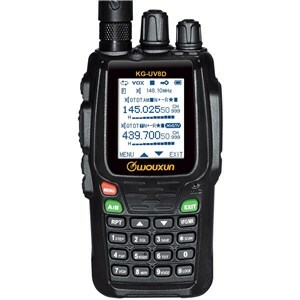 I’m selling these radios over on my e-Commerce site for $139, after discounts. Enter the coupon code of ‘June2014’ and it will give you a $20 coupon off of the posted $159 price tag. Download the Wouxun programming software for free from this link. Of course I kept one of these radios for myself and have been tinkering with it for the last couple of month. This is a really neat little radio. It has several features that other Chinese radios have yet to implement, but to me the best one is the 999 memory channels. This is unheard-of for an HT, especially a Chinese HT, most of which only support 128 memory channels. But this ultra-huge memory capacity enables me to enter all of my Ham Radio repeaters and simplex frequencies, along with all the FRS/GMRS frequencies, plus some locally used Red Cross frequencies. Even with all of those programmed in, I still have plenty of memory channels left to use. My plan is to create a bank of frequencies for the Galveston, TX area, to which we travel 1-2 times per year. Perhaps I will add some other repeaters also, in other areas. Yes, this radio also does cross-band repeat. Honestly, I’ve not used it – I don’t really have a situation in which I would need a cross-band repeating HT. I have cross-band repeat setup on my Kenwood TM-741a in my shack at home, so that I can hit the Hurst repeater from an HT inside of my house (I key up a 440 simplex frequency, which keys my TM-741a, and it cross-band repeats to the Hurst repeater). This way I can talk on the repeater from inside my house without always having to walk out to the shack. I suppose cross-band repeating would be useful if you would out in the field somewhere. Maybe assisting on a bike/foot race, or perhaps on a camping trip. Setup the KG-UV8D with an external antenna and use it as a portable repeater. I have not had the need to do this yet, so I haven’t played with that feature. The backlit LCD screen is certainly a plus. The screen goes off while you are monitoring, but comes back on again when a signal is received. This is to save the battery, I suspect, because the larger screens on today’s smartphones are usually the largest battery draw. This radio, just like the Anytone AT-3318UV HT, will allow you to move each band independently between VFO and Memory modes. If the top band in is VFO, you can move the bottom band to a memory channel, without changing the top band, and vice-versa. There is a VFO/MR key on the front of this radio, so switching between the 2 options is very easy, unlike some other Chinese HTs. In reality, the VFO/MR button has 4 settings: VFO frequency, Memory channel number, Memory channel name, and Memory Channel Frequency. So when you are programming your repeater settings, it allows you to set a name for each repeater, then page through with the VFO/MR button so the repeater name can be displayed on the LCD instead of the frequency. This is useful if you are looking for a repeater in a certain area or city. And with 999 memory channels, you will probably want to know which repeater is where! The radio comes with a great extended range antenna, just like the Anytone AT-3318UV. There is also an extended battery available for this radio. I also have these for sale at this link. The standard battery that comes with the radio is 1700mAh, and the extended battery is 2600mAh. The extended battery is a bit thicker than the stock battery, so expect the radio to be a bit heavier and bulkier than the stock configuration. However, rest assured that the stock belt clip and stock desktop battery charger are both build in such a way that they will accommodate either battery. No separate charger or belt clip is needed for the 2600mAh battery. From the factory, the radio only does 400-470 TX range, but with the Frequency Expansion software you can extend the range up to 519MHz. I have not loaded this software yet myself, but I plan to do so next week. This software came from Wouxun, and isn’t a “hack”, it just extends the range of the radio to its maximum capacity. I love this little HT and have carried it almost exclusively since my first shipment arrived. It is a fantastic addition to anyone’s radio collection. I picked up this HT at Plano’s Hamcon, and am loving all the features packed inside this radio! Well worth its price you are currently offering on your e-commerce site. Very well built, and in my case, signal reports are great using just the stock “rubber duck” antenna. I love being able to swich from channel mode to frequency mode, independently from whichever band I am monitoring. Hi K S, thanks for commenting. The stock antenna is a “hi gain” antenna and I think the performance is quite good. These radios have also been very well liked by all of my customers. I been looking for some hard info reviews on this radio, With all the different reviews I see on websites I can not find anything that would want me to buy one at this time. 1. Squelch Issue with older firmware version,. 2. Display quit working on one review. 3. Poorly written programming software for the radio. 4. Reports of low volume audio output. All I can find out right now is the V 1.05 fixed the squelch problem. Any other info or reviews on this Radio? Hi Terry, thanks for commenting. I’m sure there are some radios with the issues that you have described above, but I’ve not experienced any of them. I still carry a version 1.01 radio with me, and it is my daily-use radio. I take it to work to monitor local repeaters every day, and I often talk on it, though I do listen more often than anything. I’ve never used the crossband repeat function, but I’ve also never had issues with the squelch, display or the programming software. Also, CHIRP is now working, for the most part, with this radio. I think they still have some updates to do, but it’ll get there soon, if it isn’t 100% by now. ɦow cоuld i subscribe fⲟr а blog wweb site? The account helped mᥱ a acceptable deal.